EDITOR’S NOTE: This guest post and the photos appear courtesy of Duncan McDonell and his advisors at school and the Institute on Aging. 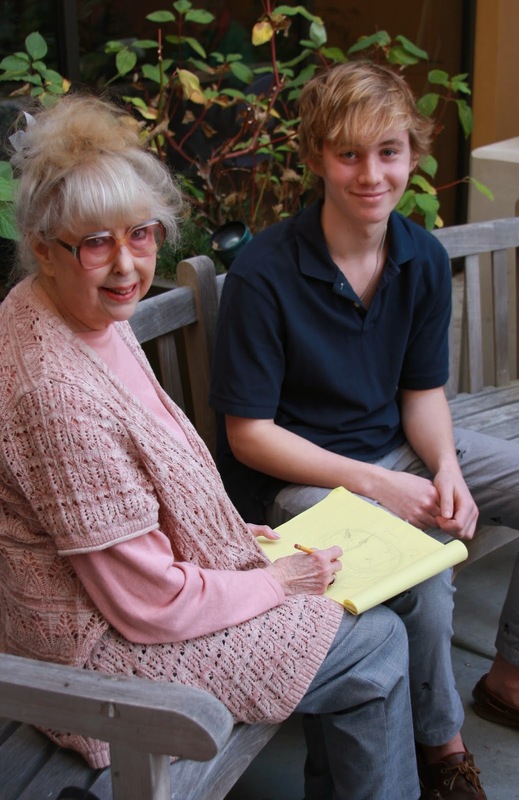 I’m Duncan McDonell, a sophomore at Stuart Hall High School in San Francisco, and I use art as a tool for intergenerational connection. As an artist, I have always had a profound interest in teaching art to help people enjoy themselves. The challenge was that I lacked opportunities to do so. 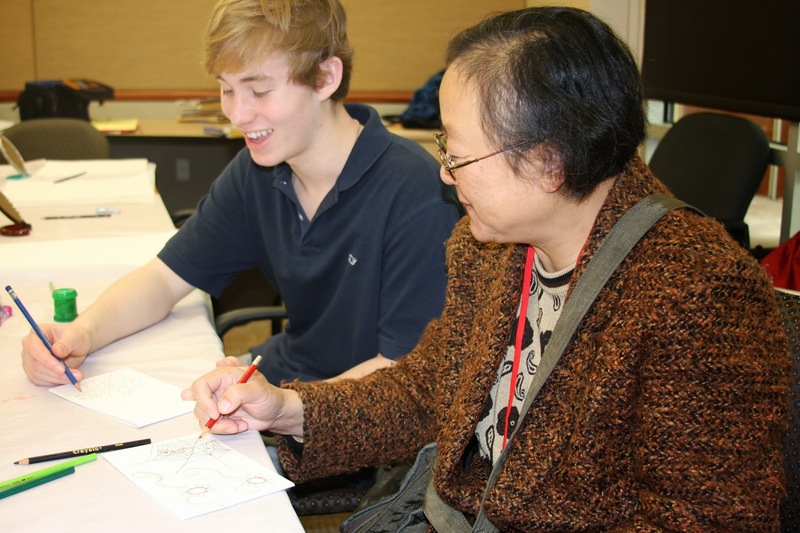 So when my service learning director, Mr.O’Connor, found an opportunity for me to teach art to seniors, I was thrilled. I started teaching art during my freshman year by volunteering at the Institute On Aging (IOA), where I was introduced to my mentor and art program director, Jessica McCracken. My initial experience teaching was wonderful, and I was immediately excited about future classes and intergenerational work. Since then, Jessica and I have worked in a variety of media to interest and excite our students. We have taught painting, drawing, card making, watercolor painting, and tissue paper painting. Thanks to the Youth Jumpstart grant, Jessica and I have been able to expand our program by involving more volunteers and by gaining more publicity through this article and other forms of publicity. These new volunteers will be coming in on March 14th for a school service day. Jessica and I also do exercises with our seniors to engage them not only visually but physically. By using a mixture of media and doing physical exercises, it helps us engage our students, especially those who unfortunately suffer from Alzheimer's and other forms of dementia. Through my work at the IOA, I have learned a lot and have had many touching experiences. For example, I once taught a man named LiBorio who seemed to be very unresponsive while being taught. He didn’t want to paint, and he hardly spoke in class. Many seniors’ talents are sometimes overlooked because of their age or physical or mental condition. People ought to focus on what seniors can do, not what they can’t. From my experience working intergenerationally, I feel that there are many benefits of young and old people working together. As a teen, I’ve learned a lot from the seniors and I’ve benefitted from some amazing stories they’ve shared with me. On the other end, I’ve found that seniors can benefit from younger people as they’ve confided in me and have complimented the class practically every time. Through this experience, I realized what a powerful tool art can be and how it can be a wonderful aid for communication. I also found that one should never judge anyone, especially a senior, by first impressions. Writers of all ages are invited to submit guest posts on intergenerational issues to our Together Blog. Here are the submission guidelines. Congratulations to Our Winning Communities!